Eleanor Roosevelt was no starry-eyed optimist, but the virtue of hope and an ethos of courage ruled her life. “Do one thing every day that scares you,” was her advice to the timid. Though she was born into a world of wealth and privilege, little Eleanor was shy and painfully conscious of “my lack of beauty.” She compensated for her shortcomings through diligent study, a keen interest in the life of her nation, and an eager will to be useful by improving the lot of the less fortunate. Eleanor was initially thrust into public life when she married Franklin Delano Roosevelt (first governor of New York and then President of the United States). As First Lady, she championed working women, wrote a weekly column advocating for the neglected, and after her husband’s death chaired the U.N. Committee that drafted the Universal Declaration of Human Rights. She maintained a steadfast hope in the future and in the progress of her nation’s ideals. Two splendid books for children chronicle the life of this witness to hope. The first is a stunningly illustrated biography for young children, and the second, a nuanced, warmly told portrayal of this extraordinary woman. 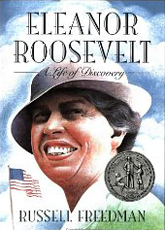 Eleanor Roosevelt: A Life of Discovery. Russell Freedman. ​but left a legacy of poetry that lifts the spirit. Hope, joy, and wonder are among her many themes. Here are a few of her verses.